This Royal Delft item is the D1653 Blue Collar Bottle No.3. A beautiful bottle that can be used as ornamental object or as untensil. The glossy pure white exterior of the bottle and the hand painted Delft blue decorated cap outside with matching blue twill tape make this bottle an of this extraordinary piece of pottery. 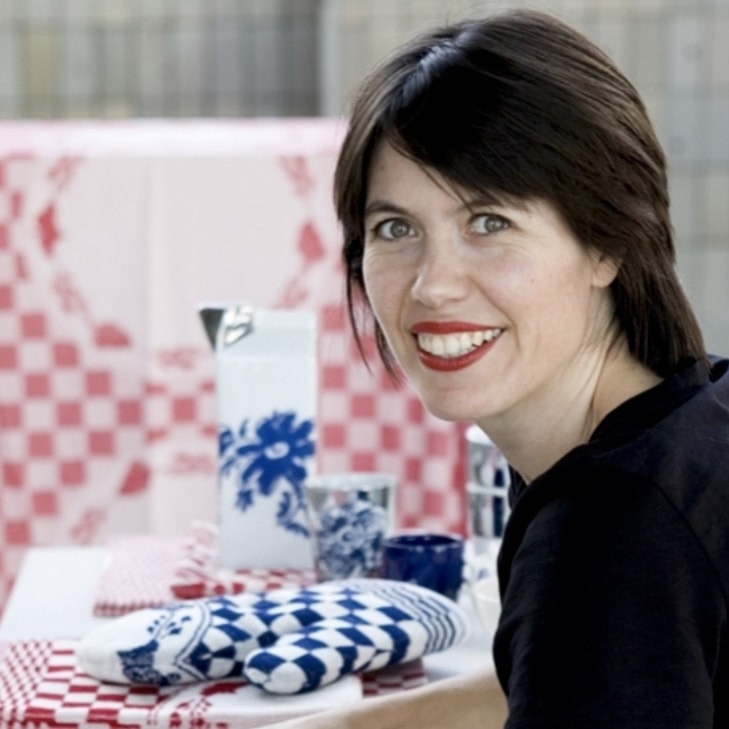 The design is by Arian Brekveld who has made a perfect blend of Delft blue tradition and contemporary design. What’s going to be the spot for your Blue Collar bowl No.3 bottle? Collect all 3! 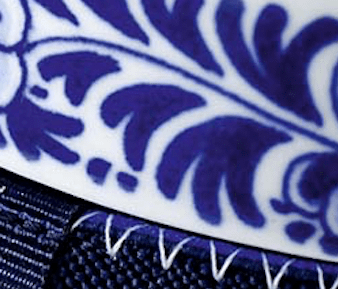 The Royal Delft D1653 collection contains 5 Blue Collar items, 2 bowls and 3 bottles, all designed by Dutch designer Arian Brekveld. This item is the Blue Collar Bottle No.3, the smallest of the 3 Blue Collar bottles with a height of 26 cm and a diameter of 13,5 cm. Apart from their practical use, the bottles are a feast for the eyes. 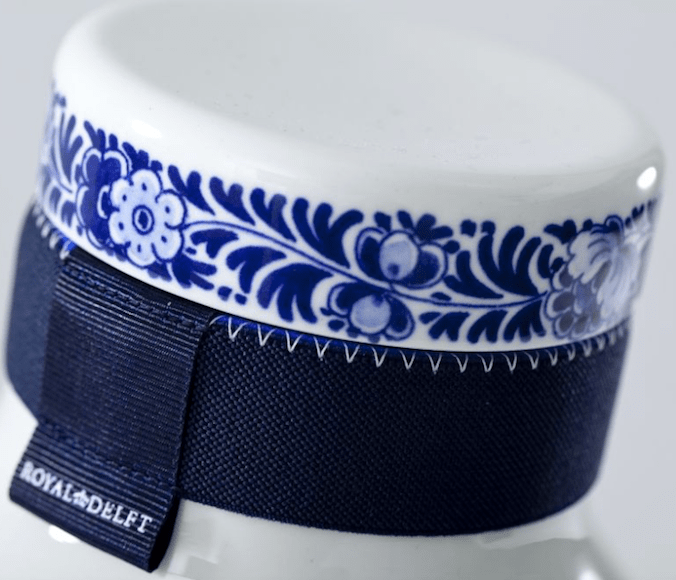 This bottle has a smooth shiny body and a Delft blue decorated cap with matching blue twill tape. The cap is hand-painted and decorated with a flower motif. You can use the bottle for milk, juice, smoothies or water. Don’t stow it away afterwards, this extraordinary piece of pottery deserves better as ornamental object. This Blue Collar bottle No.3 is inspired on the closet-couples from the 17th and 18th century Dutch history. In this Golden Age the tradition arose in Netherlands to decorate cabinet and fireplace mantle with design, like pots, bowls, vases or bottles as a sign of wealth and good taste. 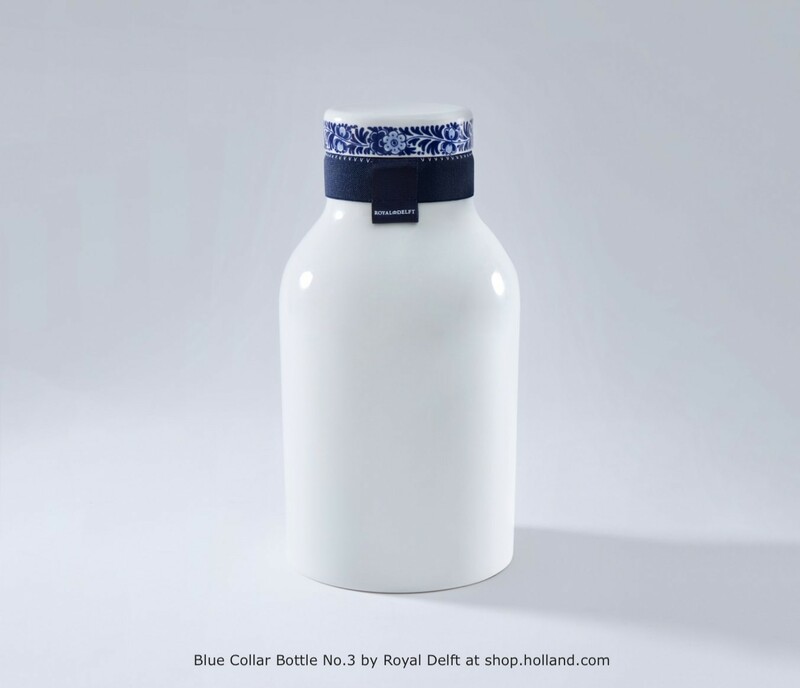 The Blue Collar bottle No.3 is produced in the in de Royal Delft factory ‘De Porceleyne Fles’ in Delft. This factory dates back to 1653 and is the only remaining and still working 17th century Delft blue pottery factory, where Delft blue pottery is still hand painted. Do the Royal Delft Experience, meet the passionate painters, check out the Delft Blue museum and stroll through the factory where craftsmen produce plates, vases, bowls and more. For more Delft blue pottery, jewelry and personal accessories see the section Delft blue in the souvenir & gift assortment of our online store. 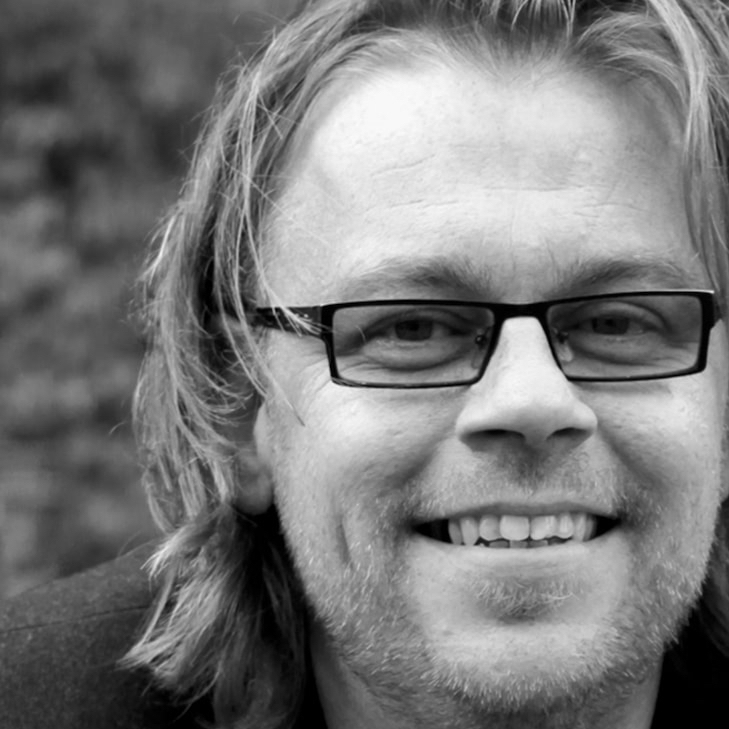 With his unassuming vision on design as starting point, Arian Brekveld creates ageless products, which are appreciated all over the world. The collection of MOMA in New York comprises several of his designs. 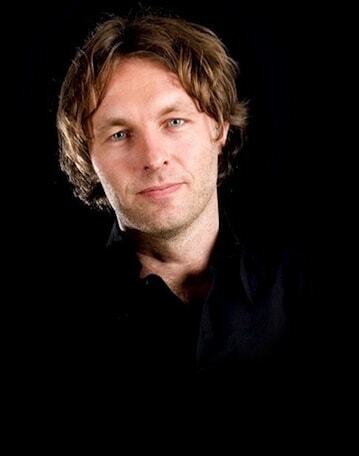 He designs products for Royal Delft since 2012. 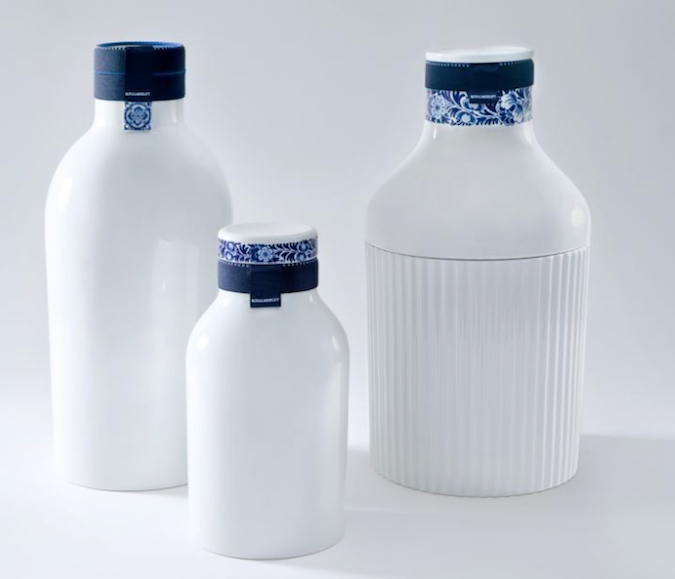 With the Blue Collar bottles and bowls he has created a contemporary interpretation of Delft blue.